First impressions are important in your Halloween door decoration. After all, you are going to get a lot of trick or treaters knocking on your door in search of goodies. Do you want to give them a bit of a fright? Maybe you want to go for goofiness in your decor. 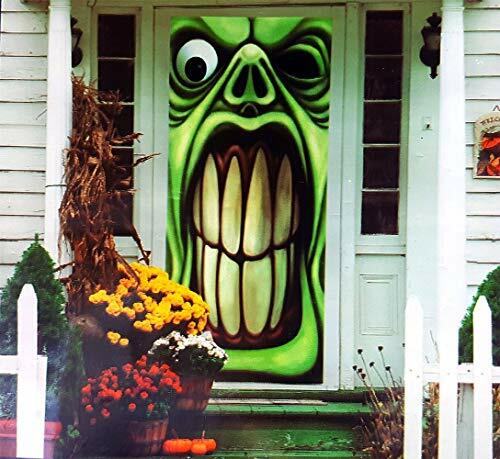 Your Halloween door decoration will set the mood for your visiting guests and kids in search of treats. For the tame at heart, consider a wreath as your Halloween door decoration. Make a visit to your local craft store in search of wreaths made from natural materials like straw or grapevine. Decide what you want the theme of your wreath to be. What are your favorite Halloween-type figures? Jack-o-lanterns and mummies are fun. Of course, there are also bats, spiders, Frankenstein, scarecrows, ghosts, skeletons, witches and goblins. Creativity is subjective, so no matter what you decide to do with your wreath, you cannot go wrong! How about spray painting your wreath black then decorating it with fake spider webs, spiders and ghosts? You can create your own ghosts using lollipops and white tissue paper. Maybe you can construct a mummy or two as well. Rummage through your child's toy box for a few action figures and wrap them from head to toe in white tissue or toilet paper. 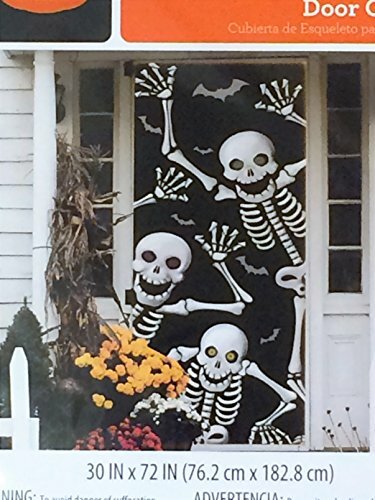 Black and white colors make for a striking Halloween door decoration. A spooky mood could be invoked with the right Halloween door decoration. If you have a bit of drawing and painting skills, you could construct a dungeon door out of a large sheet of Styrofoam and paint it to look like the entrance to a dungeon. Have some sound effects like rattling chains handy for the arrival of your prisoners, err, guests. Go one step further with this Halloween door decoration idea and create a whole new entry way using Styrofoam. Paint the Styrofoam entryway to look like the dingy cobblestone walls of a dungeon. A rather creepy Halloween door decoration involves black butcher paper and bright red paint. You can find large rolls of colored paper at teacher or office supply stores and red paint at a home improvement store. Cover your door in the black paper. Pour the red paint into a disposable bowl or plate. Dip the palms of your hands in the paint and make handprints on your covered door. The more your paint drips, the better. The red is supposed to resemble dripping blood. Write phrases like "help me" or "I've lost my head," using a paint drenched finger. Spiders are cool and would help you in creating a great Halloween door decoration. Cover your door entirely in fake spider webs. Purchase a disgusting looking fake spider to hang in the webbing. To add an extra special touch, borrow a stuffed animal or Barbie doll from your child. Take some spider web and wrap it around the doll, almost like a cocoon. Make sure that part of the face or a body part is visible, and then attach your cocoon to the webbing on the door. Now your spider has a meal ready and waiting for him! 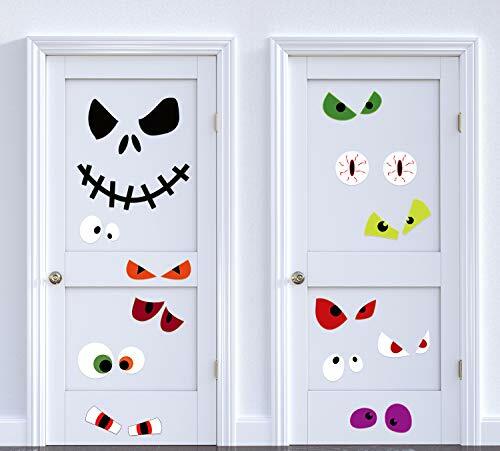 These Halloween door decoration ideas are just a few of many that you could create. All are low cost options that provide high entertainment value. Depending on the spook factor you are aiming for, you could be tame for the kiddies or outright ghoulish for the teens and adults. Remember to just have a lot of fun when creating your Halloween door decoration!